welcome back from the weekend, I hope it was enjoyable and you were able to do something fun. Malik and I went shopping for his dormitory needs…I am not even going to tell you how much money we spent. It should be a Blue Monday but instead it’s a Steel Grey Day. This top was thrifted from Goodwill and the skirt is a JCPenney clearance find. Thankfully, I know how to save when it comes to shopping for myself, my checkbook really took a hit this weekend! The l.e.i. sandals are several years old and were purchased from either Walmart or Kmart, can’t remember which, but I do know that I love the cork and stud details. I used to shop online at Jewelrymax.net which is where I purchased the necklace, and the bracelet was a Flea Market find. Believe it or not, I haven’t set up a table nor even visited the Middletown flea market this entire summer! I hope your Monday remains stress free and if you get a chance, stop by at Whitney’s blog to check out her Personal Style Linkups. Yes, you are correct – fortunately it’s warm and sunny. You look Fabulous here my Sista and you make grey colorful. Enjoy! Thanks BlogSistah, now I need some more green in my wallet!! Love the look. Is the blouse a paisley print? Thank you cuz, yes, it’s paisley. it’s crazy right…trying to save money with “kids” in college is a never ending battle. Have a wonderful holiday weekend! Thank you kind sir, I do hope you are enjoying this beautiful Thankful Thursday. You have the best shoes! Love the stud details. I know your son’s room is all decked out! Robin, please, you mean my son’s room is all “dusted out”, unless of course you are talking about his new dorm room with 2 roommates!!! Hope you are enjoying your week! I love grey! You put together a great look here! Hope you are having a wonderful week! Lauren, thank you. 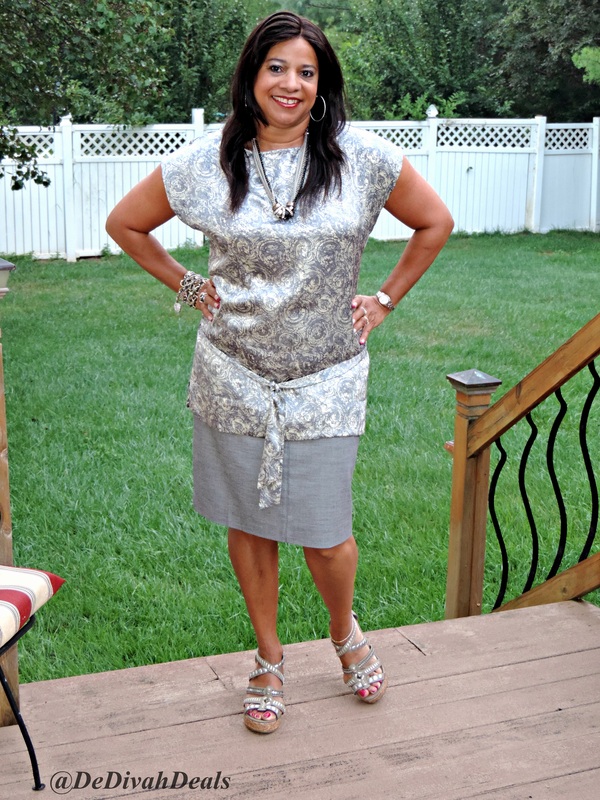 Grey is such a neutral color which can be worn any season. Happy Thankful Thursday. You look absolutely incredible doll. I love those shades of grey on you. Cute outfit!! Love how you put it all together….it looks like a high end mall outfit! I usually only buy clothes on sale and a lot of times at Walmart! I just don’t have any luck at Goodwill or thrift stores….my usual size does not fit me! Thanks for visiting my blog! Following you! AnnMarie, thank you very much. I too am a Walmart shopper but like thrifting more, you have to search all sizes and then try stuff on, because sometimes it’s harder to find your regular size. I have some other tips and hints in a recent “Up Close and Personal” interview with @MrsLookingGood, check it out and thanks for the follow! That is nice office dress.